Jaws is a 1975 American thriller film directed by Steven Spielberg and based on Peter Benchley’s 1974 novel of the same name. 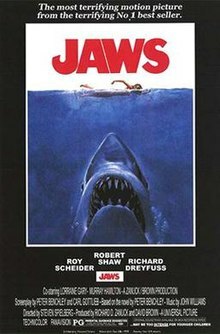 In it, a giant man-eating great white shark attacks beachgoers on Amity Island, a fictional New England summer resort town, prompting police chief Martin Brody (Roy Scheider) to hunt it with the help of a marine biologist (Richard Dreyfuss) and a professional shark hunter (Robert Shaw). Murray Hamilton plays the mayor, and Lorraine Gary portrays Brody’s wife. The screenplay is credited to Benchley, who wrote the first drafts, and actor-writer Carl Gottlieb, who rewrote the script during principal photography. Shot mostly on location on Martha’s Vineyard in Massachusetts, Jaws had a troubled production, going over budget and past schedule. As the art department’s mechanical sharks often malfunctioned, Spielberg decided to mostly suggest the shark’s presence, employing an ominous and minimalistic theme created by composer John Williams to indicate its impending appearances. Spielberg and others have compared this suggestive approach to that of thriller director Alfred Hitchcock. Universal Pictures gave the film what was then an exceptionally wide release for a major studio picture, on over 450 screens, accompanied by an extensive marketing campaign with a heavy emphasis on television spots and tie-in merchandise.